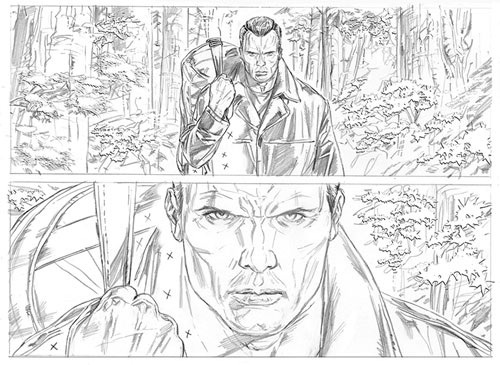 Valiant is proud to present the first look inside BOOK OF DEATH: THE FALL OF BLOODSHOT #1! On July 22nd, New York Times best-selling writer Jeff Lemire (BLOODSHOT REBORN, Descender) and superstar artist Doug Braithwaite (IMPERIUM, Justice) join the summer’s monumental comics event to chronicle Bloodshot’s ultimate fate in a visionary tale of present and future torn directly from the pages of BOOK OF DEATH! Plus: don’t miss the essential first chapter of the blockbuster Valiant event of 2015 in BOOK OF DEATH #1 (of 4)! Start reading here as all-star creators Robert Venditti, Robert Gill, and Doug Braithwaite begin a thousand-year journey into the future of the Valiant Universe…and rain, fire, blood and war on the heroes of today right here on July 15th!